While UK Prime Minister Theresa May is losing control, Turkish president Erdogan is solidifying his, with traders closely watching the cabinet Erdogan would appoint after he was officially sworn in as a "president with enhanced powers." 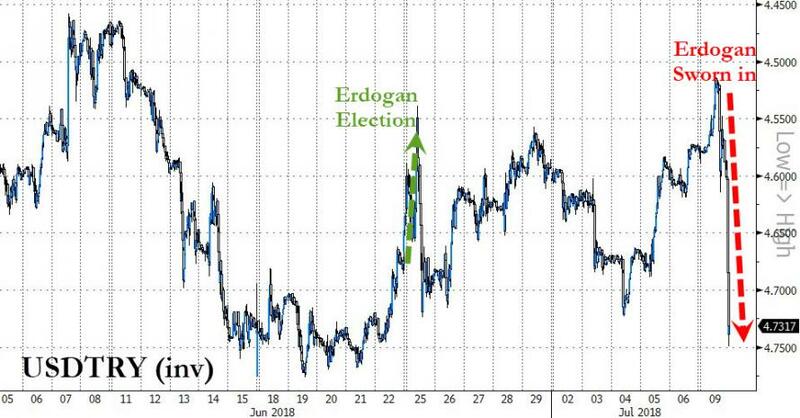 What happened next shocked traders, when Erdogan appointed Berat Albayrak, the former minister of energy and his son-in-law as Minister of Treasury and Finance, while dropping the last men standing who had any credibility with the market. As a remindew, Albayrak gained some prominence in late 2015, when a CHP lawmaker Eren Erdem accused Albayrak of being linked to ISIS oil smuggling, claiming that he was able "to establish that there is a very high probability that Berat Albayrak is linked to the supply of oil by the Daesh terrorists." Albayrak is also linked the jailed Turkish-Iranian gold trader Reza Zarrab, who allegedly was charged with helping Iran sidestep US sanctions to export oil with the assistance of corrupt Turkish high officials and then to launder the income. As we reported last December, Zarrab named a confidant of Erdogan, the former Turkish Economy Minister Zafer Caglayan, as having taken bribes amounting to over US$60 million and also implicated Turkey’s Aktif Bank, which is part of a holding company headed at the time by Erdogan’s son-in-law, Berat Albayrak. Erdogan also named Fuat Oktay, formerly a senior official at the prime minister’s office, as his vice president and kept Mevlut Cavusoglu in place as foreign minister according to Bloomberg. Hulusi Akar, the chief of staff who was held hostage during the night of a failed coup attempt against Erdogan in 2016, was named as defense minister. Mustafa Varank, an Erdogan aide, will be in charge of industry and technology. But today's surprise double whammy came when Erdogan left out from his cabinet the current Deputy Prime Minister Mehmet Simsek who as Bloomberg writs, "was practically the economy czar of the government." Simsek was deputy prime minister, and the last man standing from a group of politicians who’ve been trusted by investors over the years to rein in the president’s go-for-growth instincts and keep Turkey’s $880 billion economy on a sustainable path. There was no job for him in the downsized cabinet of 16 ministries -- or for Naci Agbal, the outgoing finance minister. Earlier in the day, a government decree published in the official gazette scrapped the old system under which the central bank governor is chosen for a five-year term by the prime minister and other cabinet members. Also abolished was the provision for the governor to have a say in the appointment of his own deputies, who sit on the bank’s rate-setting Monetary Policy Committee. A second decree outlining who will make those decisions in the new presidential system is expected in the coming hours, Cemil Ertem, a senior aide to Erdogan, said on Twitter. It’s “certain” that the bank’s governor will be appointed by the president, Ertem said. ... as investors expressed their dismay that in addition to taking over government, Erdogan now appears set to also subjugate the economy, making it her personal fiefdom. For context - this is the biggest collapse in Turkey's currency since July 2016's coup attempt.